I like watch TV via computer, the biggest reason is I like watch different TV program especial some foreign TV program. Another reason is free, you do not need pay anything. Internet TV is a good way, you do not need TV turner, just access internet. We can find lot of internet TV programs online, some websites have internet TV direction, you can stay one site watch different TV programs. Another way is use some software that lets you open software watch internet TV without open browser. TheChanner is a kind of TV software, it lets you watch internet TV on computer or cellphone. Last device is very good, and most TV programs are lack this function. If you have wifi and 3G cellphone you can use it to watch internet TV program on your cellphone. You can download a software from TheChanner, it has two parts, one is for PC, another one is for cellphone. If you only want use cell phone just pick cellphone application mode. After you installed you can open it to watch TV online. 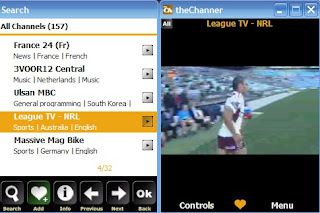 TheChanner is not a p2p client, it just uses a regular http protocol, so it is good for cellphone, if your cellphone can get online you can watch TV program anywhere around the world. Now, TheChanner is a beta version, you need register an account before you download it.